Happy Thursday!! You’ve probably noticed that I’ve been wearing my Chanel, YSL and Louis Vuitton bags A TON lately because I love how they instantly dress up my look. I’ve always loved designer bags and I’ve mentioned before (in this post) how even though they can be an investment, they are pieces in my wardrobe that will never go out of style and that I’ll use forever! Today I’m excited to be partnering with Trendlee again to share a few designer bags that I absolutely love! In case you didn’t know, Trendlee is the perfect destination to find pre-owned, high quality luxury bags at a discounted price. 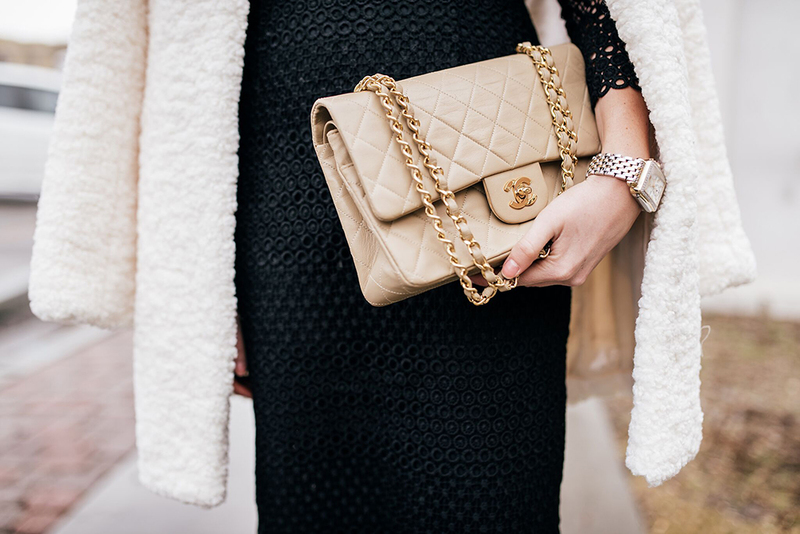 This Chanel Vintage Flap is timeless; a bag that I’ll wear over and over again! I love the beige color and the size is perfect. It’s big enough to fit everything I need for a date night but also small enough to wear a variety of ways. And the gold hardware and chain is super stylish and chic! I’ve made a collection of my favorite designer bags from Trendlee that you can shop! Use code PINKP to enjoy 5% off your next purchase! Thanks so much for stopping by!!! Brought to you by Trendlee. Classy and ladylike outfit! I like your dress very much! Gorgeous dress! That Chanel is just a beauty! A designer bags always makes an outfit that much better! Thanks Erica, I think the same thing! This outfit is definitely chic and I love it! I love the classic colors with different texture. That chanel bag will always be a favorite! Oh thank you! You are so sweet! One day you’ll get your bag!!! Absolutely beautiful … Timeless elegance … A true vision of beauty and style! Always looking fabulous! Love the sleeves on this dress, so gorgeous! Love that purse! The right purse really does dress up an outfit. Loving the black dress too! Thank you! I love adding a purse to an outfit! That bag is so classic! Love Love Love the texture on this dress! It’s so cute!! I love all of your bags! I had never hear about this company, I will definitely give it a try. Oh, I’m glad you are going to try it! It’s amazing! Such a beautiful dress!! I love that belt, and it looks so chic with that bag. Love your makeup here too!! I mean, these boots are amazing! You look great! That’s a gorgeous bag and I love your dress so much! I love this look it’s so classic and chic as you said. The bags in your collect are amazing i’m definitely lusting over the YSL sac du jour in pink. Love those bags, they are so timeless! 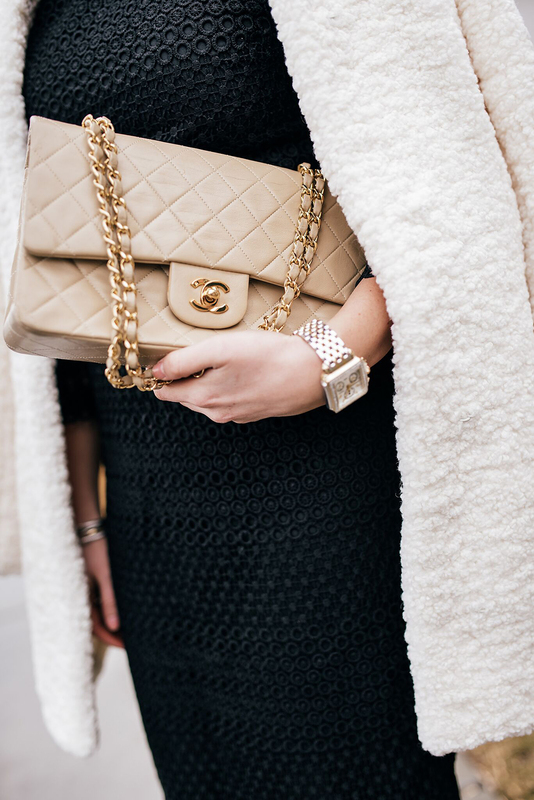 The Chanel looks great with your coat. So nice to see the dressier outfit. Love to see ways to be stylish and chic everyday. Your dress and coat are amazing. Re: your Snap stories (because I can’t figure out how to swipe up to comment) First off you look beyond amazing in everything! And second you nurtured and grew 2 gorgeous children, that’s amazing and so beautiful! You cares if you don’t look “perfect”, you’re beautiful just the way you are! Thank you so much Emma, I really appreciate your sweet words. Thanks for following along! This is beautiful! So classic. Also my friend and I have followed you for years, we are not commenters don’t actually even read comments normally. However, we were so impressed with your snapchat story today and just admire you so much. Also you LOOK AMAZING for having two kids and I can’t believe anyone would make a negative or questioning comment. So thanks for standing up for being abnormal woman and being confident with how your body looks in this stage of life and not photo editing. Just thought I’d let you know we really had a lot of respect for what you said and how you handled it and wish we were as hot as you after having two kids! Aimee, thank you so much, you are so sweet. I really appreciate you following along and your kind words. Oh, you look so chic! Love the look.